A point won away from home should never be dismissed but the Pars may look back on this game as two points dropped as a vital penalty miss stopped them taking the lead at Tannadice. Another gritty performance by the Pars saw them come home from Tannadice with a deserved point which was again largely due some excellent performances in defence. There is no doubt the fans that followed the team up to Dundee would have preferred to see the side being a little more adventurous going forward because the quality of the opposition was nothing to fear. However, if the current injury ravaged side can pick up points away from home it bodes well for when this injury crisis starts to ease. 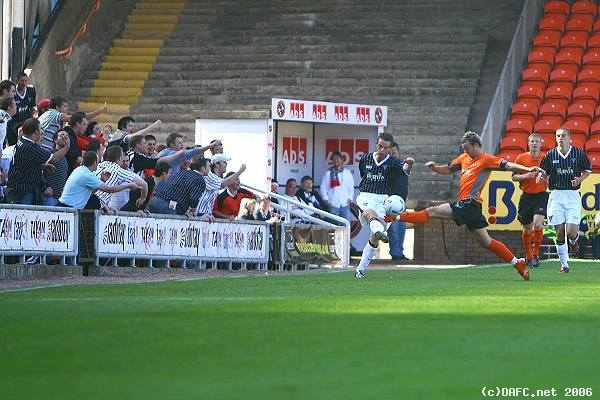 Mark Burchill hits the bottom of the right post with this effort. It was essentially the same starting line up as the previous week. McKenzie in goals with Wilson, McGuire and Bamba the defensive trio with Woods and Muirhead the wing backs. The centre midfield had Simmons, Mason and McCunnie. Tod and Burchill were the attack force. United started the more positively setting the tone for much of the game that was to follow. Bamba put the ball out for a corner in the first minute with the corner easily cleared. Burchill attempted a lobbed shot that went well over the bar causing no danger in 3 minutes. Simmons got a head knock in only 6 minutes which would lead to him being replaced by Darren Young 15 minute later. Some Pars fans may have criticised the management and directors for the delay and lack of signings and in some cases the questionable quality of those that have been signed but there can be no criticism of young Callum Woods who has slotted into the right back slot and is looking better and fitter with each game. He has two good feet which later meant him switching to the left hand side. He is also very comfortable with the ball at his feet. The one minor word of caution is that he needs to control the wild edge to his play which saw him pick up another yellow card for a clumsy challenge in 9 minutes. Scott Wilson picked up a yellow for what he clearly indicated to the referee was his first foul and he was right the referee was too quick with his cards towards the men on black shirts. From a tactical point of view the Pars were playing too many high balls to Tod who was not winning much against Archibald hence the ball was simply being given back to United. However, the Pars had a great chance to score when Burchill was fouled in 19 minutes and after brushing himself down he blasted his shot against Stillie’s left hand post with the keeper going the other way. Noel Hunt getting stick from the fans. McKenzie got himself into a fankle in 24 minutes when he punched a ball instead of catching but he sliced his effort and Bamba stepped in to slice his clearance away for a corner. A few minutes later Bamba attempted an ambitious overhead effort from a Pars corner. Duff hit a free kick well over after Wilson had chopped down Samuel. Burchill had a good effort when he shot across the goal mouth in 36 minutes. Noel Hunt was being well marshalled by his former team-mates with McGuire upending him in 38 minutes with Phil getting another yellow card. Woods had a good effort again wide in 40 minutes before he switched to the left as Muirhead went off injured with Aaron Labonte coming on. Half time 0-0. No hesitation from the ref! The second half started with more of the same. The Pars punting the ball towards Tod and Burchill and United picking it back up and coming up against the solid Pars defence. McKenzie made a couple of good saves and his defence with McGuire and Wilson in particular getting in good challenges and interceptions to limit United getting any clear cut chances. United had more chances to score reflecting their possession but the Pars refused to give in. In 76 minutes Burchill latched on to a ball from Labonte and as he cut inside from the right on his left foot he hit his shot well over from a good position. Craig Brewster tried to change things with a double substitution but the Pars made no change until McCunnie was replaced by Morrison with only 3 minutes left which seemed a bit pointless. Final score 0-0.